We’ll define 6 Sigma and show you the 2 methodologies of every 6 Sigma project. Do you want your products to have fewer defects and your manufacturing process to have less variability? Then you need 6 Sigma. Through intensive training, focused projects, and effective statistical analyses, 6 Sigma could save your business a lot of money. Fortune 500 companies have saved an estimated $427 billion after implementing the 6 Sigma methodology, according to iSixSigma magazine. There’s plenty of information about 6 Sigma along with training courses to get certified and start using the process. Instead of going over everything about 6 Sigma here, we’ll give you a brief overview of the two main methodologies used in the process so you’ll know what to expect if you decide to implement 6 Sigma. But first, let’s define 6 Sigma. By using statistical models, 6 Sigma practitioners will methodically improve and enhance a company’s manufacturing process until they reach the level of 6 Sigma. 6 Sigma originated at Motorola in the mid-80’s when engineer Bill Smith approached CEO Bob Galvin with ideas for improving product performance by optimizing the manufacturing process. In 1996, the CEO of General Electric, Jack Welch, launched his own 6 Sigma program and became a global evangelist for the process. In all 6 Sigma projects, there are 2 main methods of achieving the same defect-free goals. Below, we detail these 2 methods. The first step in DMAIC is define. The purpose of this step is to identify the main problem in your business, your goal for improvement, any resources you may need to reach your goal, the scope of the project, and the timeline for completing the project. Businesses typically use a project charter to organize the details of this step in the process. The second step in DMAIC is measure. The purpose of this step is to decide what you’ll be measuring throughout your project to compare it to the final results to know if you’ve made progress at all. First, you should assess your baseline performance by answering the question “How good is your manufacturing process and quality of product output right now?” and then, get your team involved in deciding what will be measured to assess your final performance. The third step in DMAIC is analyze. The purpose of this step is to identify the root causes of the problems in your manufacturing process. Create a long list of potential root causes for product defects and then narrow the list down to the top 3-5 causes. Now, start collecting and measuring data on those causes to validate them as actual root causes or not. Here is a variety of tools to use in the analyze stage. The fourth step in DMAIC is improve. The purpose of this step is to find and implement a solution to the problems you identified in the analyze step. Brainstorm and apply both standard and creative solutions to the key root causes in order to permanently improve your processes. You should also test each solution to determine its effectiveness, and once an effective solution is found, you should detail an implementation plan and deploy the solution. 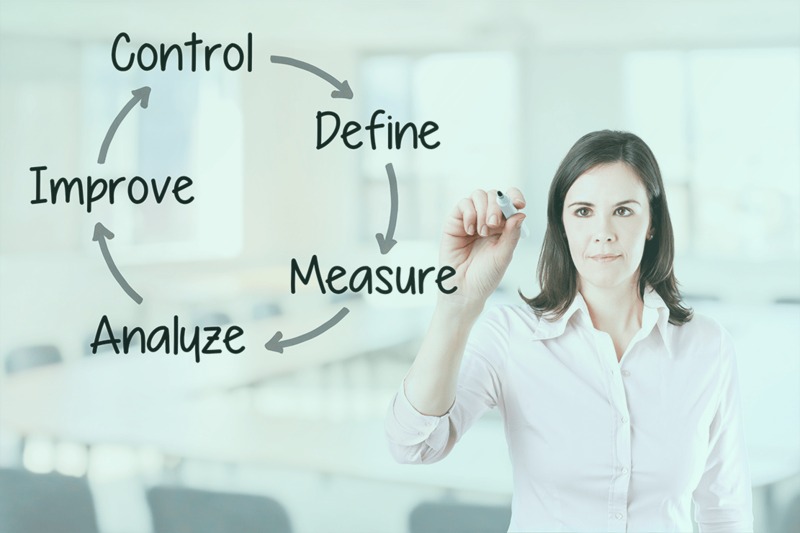 The fifth and final step in DMAIC is control. The purpose of this step is to maintain the progress you’ve made thus far and prevent your manufacturing processes to slip back into previous inefficiencies. To keep control, you should monitor the improvements you’ve made, regularly analyze them to ensure they’re working properly, and create a response plan in case one of your processes becomes unstable. The first step in DMADV is define. The purpose of the step is similar to the “define” step in DMAIC: identify the reasons why you’re developing a new process, product, or service. Write down those reasons, and then set measurable goals and milestones that align with your budget and objectives. Make sure to include the customers perspective when establishing your purpose for the project to ensure that what you create is customer-centered. The second step in DMADV is measurement. The purpose of this step is to identify the factors that are critical to quality. Define the requirements and features for your project, the target market for the project, and the design components and parameters to measure the quality of the final product. Once you’ve identified all the critical quality factors, translate them into clear project goals. The third phase in DMADV is analysis. The purpose of this step is to establish the metrics by which you’ll analyze the final product. Construct simulations of the process, product, or service, develop conceptual designs, and evaluate and select the best components. The fourth step in DMADV is design. The purpose of this step is to produce the final, detailed design of the process, product, or service. After you’ve developed the final product, you should release it for customer or user feedback. The fifth and final phase of DMADV is verify. The purpose of this step is to gather the feedback you received in the design phase and use it to make necessary changes and modifications to your process, product, or service to remove any and all defects and errors. This is an ongoing step that ends once you’ve successfully reached your goals you set forth in the define step. Now that you know what 6 Sigma looks like in practice, you’re better prepared to decide if 6 Sigma is right for your business or not. Here’s a long list of resources to help you get started. If 6 Sigma isn’t right for you at this time, but you’re still interested in improving your manufacturing process, then check out a similar process for streamlining your business called lean manufacturing. And if you’re interested in improving other areas of your business, then find out how DEAR can upgrade and automate your inventory management.